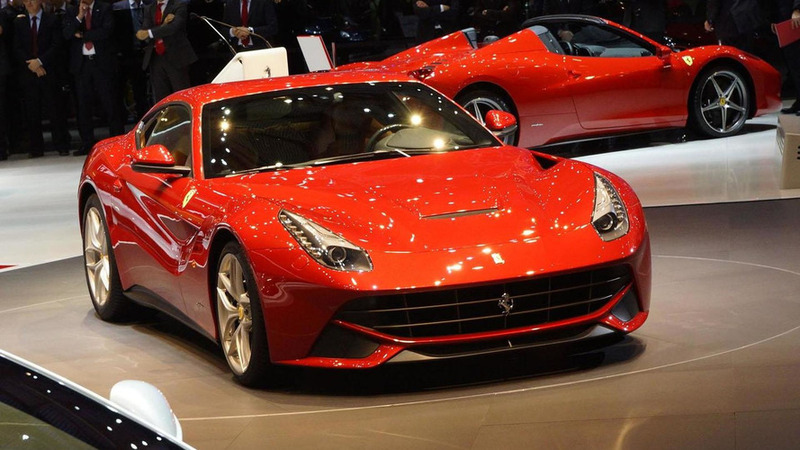 Ferrari has officially unveiled the F12 Berlinetta at the Geneva Motor Show. It has a 6.2-liter V12 engine with 740 PS (544 kW / 730 bhp) and 690 Nm (509 lb-ft) of torque. Ferrari has officially unveiled the F12 Berlinetta at the Geneva Motor Show. Designed to replace the 599 GTB Fiorano, the F12 is the most powerful road-going model in the company's history. It features a 6.2-liter (6262cc) V12 that produces 740 PS (544 kW / 730 bhp) and 690 Nm (509 lb-ft) of torque. The engine is connected to a dual-clutch transmission which enables the 1525 kg (3362 lb) supercar to accelerate from 0-100 km/h in 3.1 seconds, 0-200 km/h (124 mph) in 8.5 seconds and on to a top speed in excess of 340 km/h (211 mph). In terms of efficiency, owners can expect to average 15 L/100 km (18.8 mpg UK / 15.7 mpg US) with CO2 emissions of 350 g/km. Underneath the car's aggressive bodywork, the F12 rides on an aluminum spaceframe which is 20 percent more rigid than its predecessor. The car also features carbon ceramic brakes, an electronically locking differential and magnetorheological dampers.